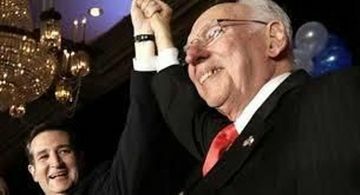 Ted Cruz’s father, Rafael Cruz, embodies the American Dream. Born in Cuba, Rafael suffered under a cruel, oppressive dictator. He began fighting Batista’s regime as a teenager and was imprisoned and tortured – beaten nearly to death – simply to be free. Rafael arrived in Texas in 1957 with nothing but the clothes on his back and one hundred dollars sewn into his underwear. He got a job as a dishwasher, making 50 cents an hour, and worked his way through the University of Texas, while learning English. Ted Cruz’s father then built a small business in further pursuit of the American Dream. Rafael Cruz became active in conservative politics during the 1980 Presidential Campaign of Ronald Reagan. He also joined the State Board of The Religious Roundtable, a grassroots Judeo-Christian organization that had an important impact on the future of political dialogue. Today, he is a pastor based in North Texas serving as the Director of Purifying Fire Ministries, ministering in the U.S., Mexico and Central America. He is also a professor of Bible and Theology, and the president of Kingdom Translation Services. His son, Ted Cruz, is the newly elected U.S. Senator from Texas. That’s why he ran for the Senate– to defend our freedom. And conservatives across Texas and nationally united behind his campaign to elect a proven constitutional conservative to the U.S. Senate who won’t abandon our principles.